Happy New Year! We hope that you and your families had a wonderful Christmas that was filled with the gifts of His grace, love and blessings. With the start of the new year, God has opened our hearts and invited us to welcome new beginnings and celebrate the amazing community before us. 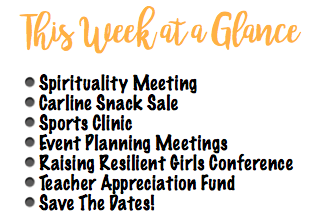 Please see below for the many opportunities happening this month. the teacher’s lounge from 8:15-9:15am on Friday, January 11th. This Friday, HSA will have a car line snack sale. All money raised will help fund this year’s Sweet Heart Dance. fun and support our 8th grade class! Interested in helping with any of our upcoming events? Bring a friend and your creativity and join us as we kickoff preparations for these fun events! Both meetings will take place outside of the gym. Wednesday, Jan. 9th after drop off. Thursday, Jan. 10th after drop off. Have any new, unused Christmas gifts or items with tags that you do not want? Contact Rachel Crum to make them a featured item at our event! On Thursday, Feb. 7th, our school will have the privilege of having Simone Marean, the Director of Girls Leadership, speak at our school. She will talk about how we can equip our girls to exercise the power of their voice in today’s world. Tickets are only $10 and are currently available for purchase. Spread the word, bring a friend and join us for this inspirational night. Annually, it is the role of the HSA to solicit donations to be used as the sole source of funding for our teacher’s annual gift presented during Catholic Schools Week. Please prayerfully consider making a donation to show your appreciation. No gift is too small. To make a donation, please send in a check made payable to the School of St. Elizabeth HSA or use Venmo (@StElizabeth-HSA) and please indicate teacher appreciation fund no later than Jan. 28th.